Windows Brands and Types of Windows we see in the Dallas area. 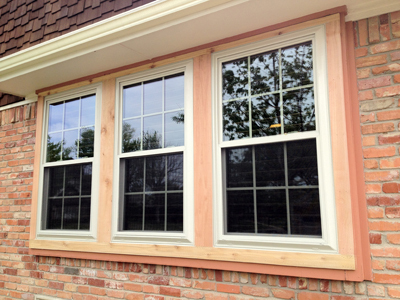 Vinyl Windows or Wood, Composite or Aluminum. Which is the best Window for Texas? What are your choices and which one is right for Dallas, Fort Worth and North Texas? In our home windows are our eyes to the world and our protection from heat and cold. Windows have improved 500% since the single paned days and about 200% in the last few years. We have to understand features, performance, longevity. types of frames, costs of windows, warranties, labor variables... wow there's a lot to get through so lets get to it! We are close to perfecting the R-10 window in the future. A window almost like a wall in it's airtightness, lack of conductivity with exterior elements and it's amazingly low solar heat gain coeffecient. Windows today are like no others. This is valuable and important to us in Dallas and the surrounding areas. It's blisteringly hot one day and freezing the next night. Sometimes we can't even sit by the window at all due to a draft or the heat. I've seen some home windows that make huge parts of the home uninhabitable. There is just no need for that in 2015 and beyond! The Ultra Max is their top of the line vinyl window with features like wood grain interiors, cutom exterior laminate colors and glazing packages that are unparalleled. Triple glazing and Krypton Gas are options as is foam filling and a variety of spacer packages. Energy Star Partner of the year 2000, 2001, 2002. Better Homes and Gardens Best Buy 2008 and a number of other consumer awards make it a super pick for a national vinyl window manufacturer. The Ultra Max is sometimes rebranded as the Preservation Series Vinyl Window. It is also sold under the Gentek banner as a Sovereign. It comes in at about 3 3/4" of frame and U Value at .26 SHGC .21. By contrast, The Mezzo can be panned up North but it's A2AO has one of the smallest profiles available in a full 3 1/4 inch jambed window. It has a frame that is just 2 5/8 inches in profile. 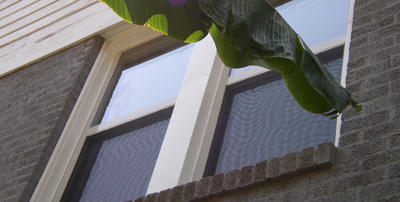 Frame thickness is a factor as to how much glass there is in a specific vinyl window. This is one of many however where we see the single hung more expensive than its big brother the double hung due to production and warranty cost concerns. The Atrium Company offer a builders grade line and two upgraded versions of their popular line. Known for its price point it is sold under the Lansing Windjammer Vinyl Window banner. It has most of the same options as a mid range product but it's lower price point may make it appropriate for a remodel or a home that is to be put on the market in the near future. Not a great pick for further down the line beyond five years or upper end homes. This is a product that is rebranded by Norandex. Private lableing is a practice that I talk about on our Competitors Page. The best approach is to find someone you trust who knows all the ins and outs of vinyl window manufacturers. Overhead, labor, advertising and sales commissions,as well as excessive staff, can all eat your home improvement dollars but small family owned business can offer personalized direction and care as well as a long term commitment to your home and your best interests for the sake of referral and neighborhood business. Much like the car world or other durable goods, find someone who can help you make a good long term plan. This is a fun shot of a little known window. All the usual options apply here in a locally made Dallas area product. Local window manufacturers are often less expensive than ones that are transported from out of state and can deliver some local accountability and customer service that is better than a national company with a great deal of territory to cover. That being said there are many window manufacturers who are in a market that simply wants cheap vinyl windows. As a rule this is not going to be an immensely long lasting product and may deteriorate in appearance after a short time. As with all products, you get what you pay for in most cases. Locally made here in Dallas this is an all time favorite for many applications. Availible in Beige White or Bronze it is among the most durable of products on the market and a long time favorite of The Window Connection. Exclusive manufacturer of our quality storm door line. This is a manufacturer we're proud to represent. They use the Guardian Brand Low E Glass for their distictive product line and also have double vertical operator in aluminum for varied applications. This is a favorite for use in homes with dark brown or bronze colored windows that need to match others on the home or just need to be bronze windows. Again a local Dallas area product with more than 30 years in the industry. A great casement line that matches the windows and an alternative to beige and white with an Adobe colored offering. Adobe is also called Sandstone or Terra Cotta from other manufacturers. You can see pictures in our gallery of this product, or set an appointment and we'll bring out samples. Energy code requires Low E Glass but doesn't guarantee longevity in a window. This is a sure long term performer for many North Texas applications. There are also affordable sliding patio doors to match the windows and we encourage that consistency when refurbishing or updating a home. Doors that match the windows speak to planning, warranty and other concerns that come up for future buyers of your home. National manufacturers have real name recognition and can offer some specialty products that are good to have. Jeldwen vinyl windows are not my favorite operating window and the reviews will bear out that it has some problems, but it does have a great application in bays and bows that are stationary. It has one of the narrowest frames available and therefore more glass than most products. It is a great option in many North Dallas, Richardson and Plano homes, as well as quite a few in Arlington and Fort Worth. 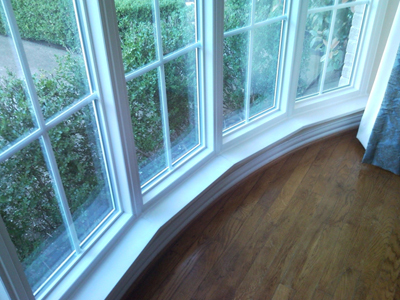 It can keep the mullions of a bow or bay window down at around 3 1/2" for a total post size. This looks modern but not too heavy and is the best option out there for a narrow framed vinyl window product. It seems like all three big wood window companies came out with terrible vinyl windows (I have no idea why). Andersen, Pella and Jeldwen make great wood windows and within the last decade have started producing builders grade windows in vinyl. The best way to find out more about any window or manufacturer is to Google search that company plus "complaints" or "reviews". "Jeldwen Vinyl Window Complaints" will have plenty of posts. Eighty percent of the replacement window market. The performance is undeniable with savings of up to 50% on some homes electric bills. Up to twice as quiet with Argon or Krypton Gas this proven performer is affordable and performance driven. While Double Hungs get all the exposure the Single Hung comes in with more glass and better U Value ratings from most manufacturers. Learn more here! The mainstay of replacement windows in North Texas, these have tilting top and bottom sashes and amazing versatility in ventilation with a full or half screen. This was one of our favorties in the past but can't perform like vinyl. It is the one that brings the dark brown windows (bronze windows) to the table. The biggest and baddest of windows is this one. Tough and durable for the next 50 years this is a window tough enough for use in buildings up to 6 stories tall in Dallas. This is a primary product for consideration when needing bronze windows or dark brown colors. The most beautiful of windows lives here! Costly but worth it if the look matters to you. Wood Windows are needed in historic areas, some homeowners associations and many of the homes in University Park or Highland Park. The classic look of grids that protrude from the glass make it a big favorite in Dallas, especially close to downtown. Truly the most amazing thing we sell is our wood casement series. We offer Marvin, Andersen, Pella and Jeldwen for our standard wood casements but can special order to your specific application. When it comes to awesome looks at a great price point this is one of our favorties. At just a $100 or so more than a typical replacement window it's a win for great wood window looks and better than average performance. @dallas_windows What do windows cost and how much are they worth when I sell my home? Some of our most recent work can be seen here! OurGoogle Plus Profile has some of our best and most recent project pictures. Recent News is always on our social networks! 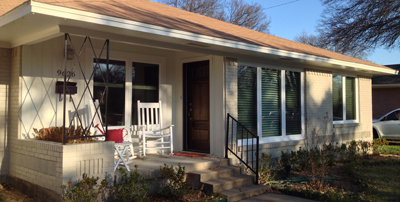 I did a great page on windows in Plano. This shows quite a bit of great info and pictures that will help. Google Plus Profile Pictures and most recent updates! Our Industry Links Page has some great window information specific to Dallas, have a look! Check out our New HTML 5 Storm Doors Page for some great new ideas on front and back doors. Call us today and let us bring the expertise and experience that will help with your window needs! Copyright 2018 The Window Connection - Dallas Tx.